Did you know that the best time to post on Instagram has changed in the last year? 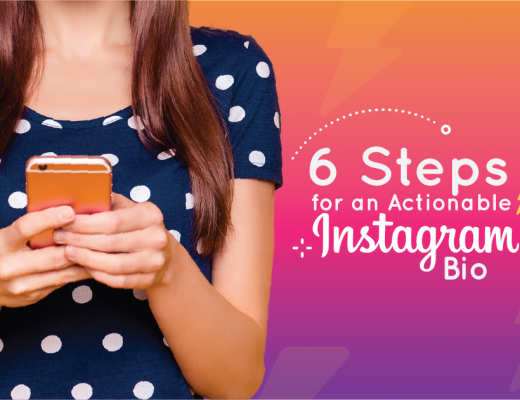 Stop scheduling your posts based on data from yesterday’s Instagram! 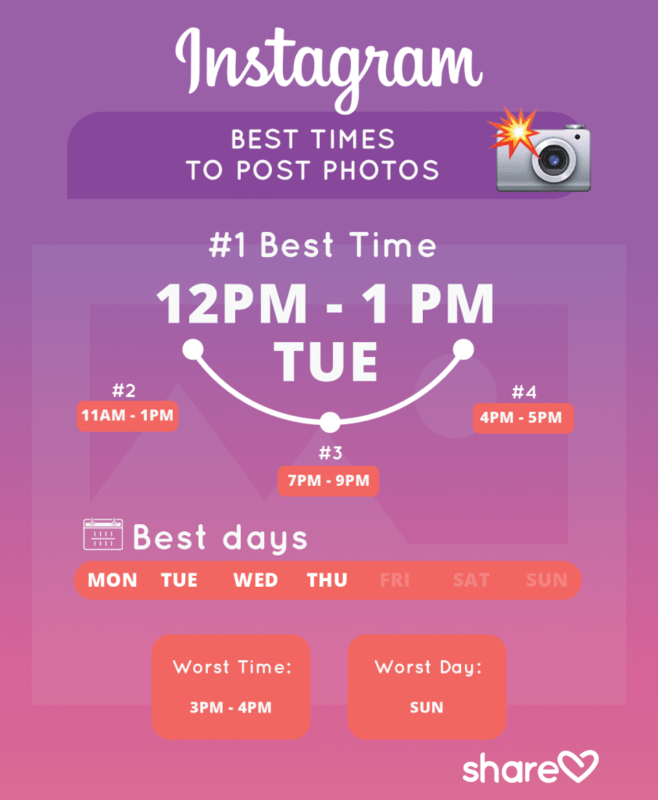 Find out if you’re missing out on prime engagement times with this easy-to-follow guide that tells you the best times to post on Instagram. Last year, Instagram announced that 1 billion worldwide Instagram accounts are active monthly and 500 million Instagrammers are daily users. The chart below shows how rapidly the platform is growing. The popular social network has also released many brand new features over the past year. One of them, You’re All Caught Up, has a direct effect on how often you should post to Instagram, which we’ll explain later in this article. 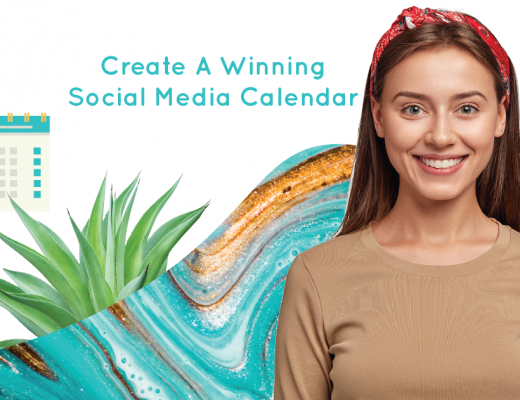 Gain an edge on your competition by spending a few minutes reviewing the latest recommendations for when to post photos, videos, and stories for your business. 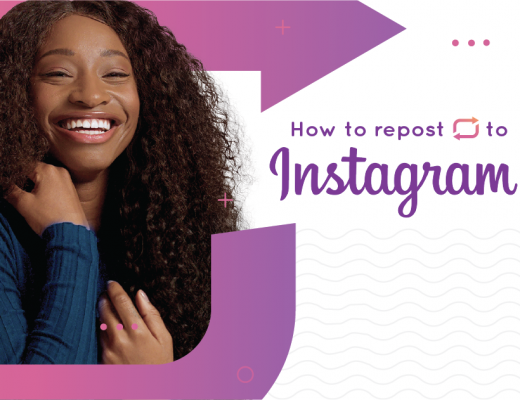 We’ll show you the best times to post, and explain how behavioral shifts and the 2018 public release of Instagram’s algorithm have impacted the engagement patterns of its users. What Are the Best Times to Post Photos on Instagram? What Are the Best Time to Post Videos on Instagram? What Are the Best Times to Post Instagram Stories? What Are the Best Times to Post Instagram Live Videos? Except where otherwise noted, our recommendations are based on two recent studies: One that polled social media managers, and another that examined the difference between posting and engagement times for 100 U.S.- focused brands.All data from these studies was compiled within the past 14 months. Be sure to schedule your posts at least a few minutes before the “best time” ends. 1. 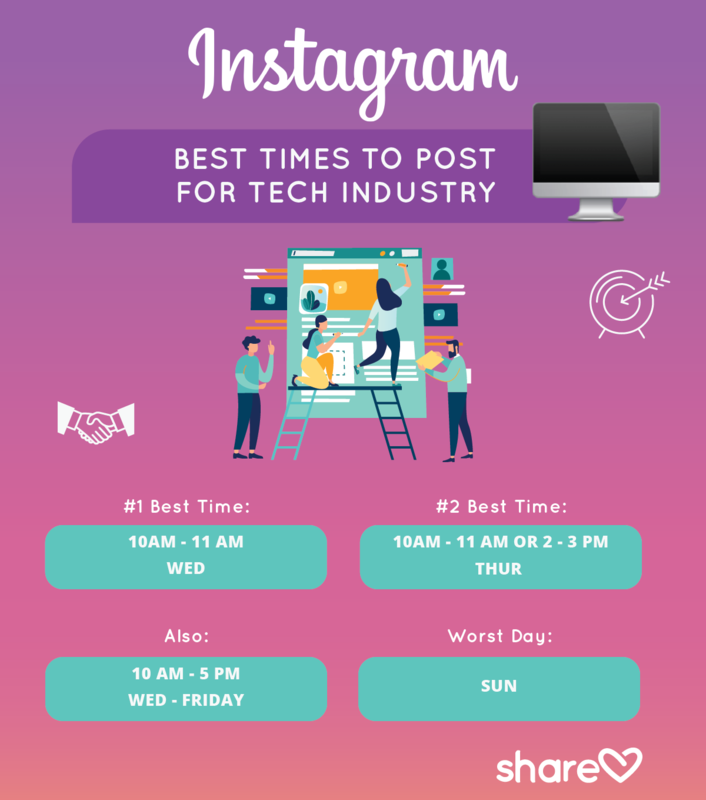 The #1 Best Time to Post on Instagram is between 12 - 1 pm on Tuesdays. Any time between 11 am – 1 pm on Tuesdays is best for brand engagement, but data suggests that 12 – 1pm is highest. Thursday lunchtime sees the 2nd-highest engagement rates, and Wednesdays are 3rd most effective. All weekday lunch hours, except Friday, received higher engagement than at any other time. Lunchtime audiences are now the most-engaged group of users on Instagram. If you’re posting photos, lean toward the early part of the lunch hour. Photos get the most engagement on Instagram between 11 am - 12 pm. 2. 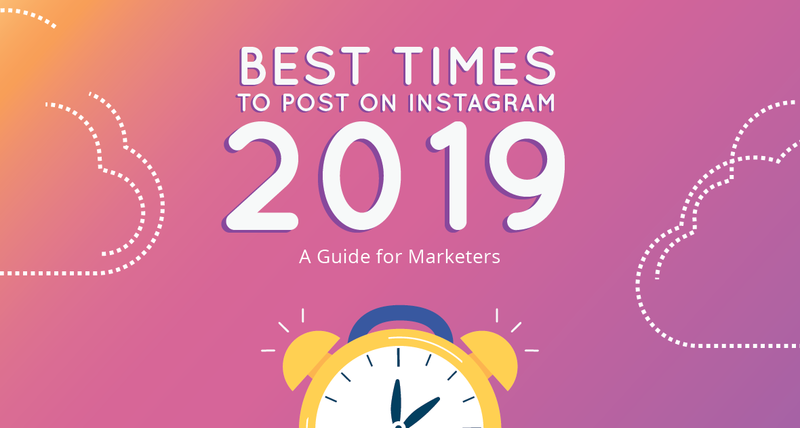 The 2nd-best time to post on Instagram is 7 – 9 pm. Monday – Thursday. 4. What are the worst times to post to Instagram? Brands don’t normally get much engagement on the weekends, and Fridays are the least productive weekday. Keep in mind that certain niche industries thrive on the weekends. In a later section, we’ll take a look at how your industry might affect the best time to post for your brand. What Are the Best Times to Post Videos on Instagram? 1. The Best Time to Post Videos on Instagram is between 9 - 10 am. According to Unmetric statistics, the highest-ever number of comments posted to videos happened between 9 – 10 am. 2. The 2nd-best time to post videos is between 1 – 2 pm. 5. The worst time to post videos on Instagram is from 10 pm – 8 am. There’s a slight peak in video engagement at 10 pm, followed by a sharp decline. Long-form video (20+ minutes) accounted for more than 50% of total video consumption across all screen types, according to a 1st-quarter study by Ooyala Media. Instagram launched IGTV (Instagram TV) in June last year. Now, brands can create their own IGTV channel that can be watched, followed, and commented on within Instagram. 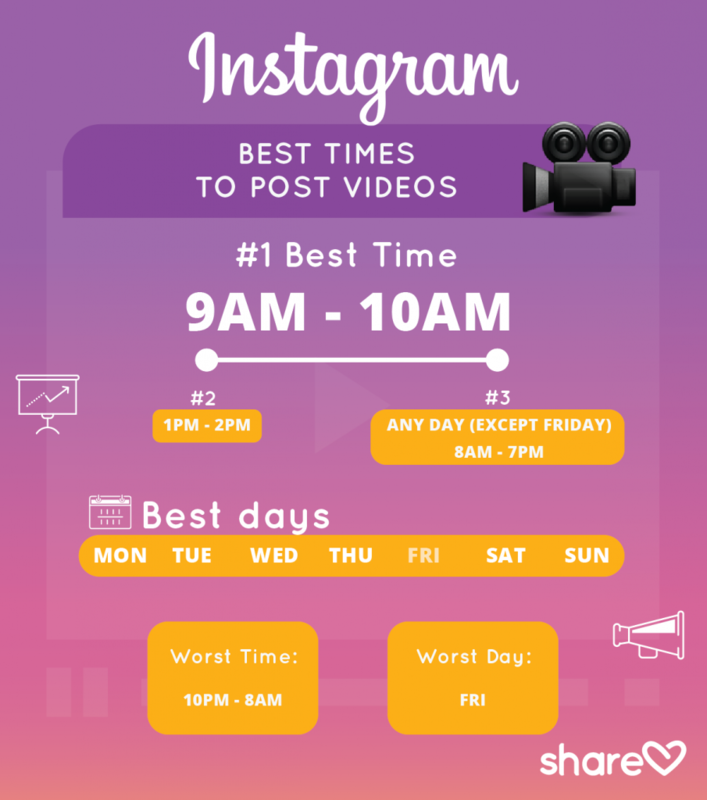 While it’s too soon to predict the best times to post to IGTV, we suggest promoting your channel by following the recommended best posting times above. Then, measure your results to adjust and improve according to your analytics. 400 million people are using Instagram Stories daily, and one-third of the most-viewed stories are from businesses. So, when is the best time to post your stories? 2. You can post at any time of the day or night, including late-night and into the wee hours of the morning. Your followers will see your stories in their feed the next morning. So when posting stories, think about ways you might encourage interaction between family and friends with creative, beautiful, and authentic content. The best time to post on Instagram Live can only be determined by knowing when most of your audience is online. To extend the life of your live video, share it to Instagram Stories and then add that story to your Highlights. Engagement on Instagram, like any social platform, revolves around the routines and habits of your audience. When you’re in an industry that operates during everyone else’s “off-hours,” chances are your best times will be different than the recommendations above. In this section, we’ll take a look at niche industries whose “best times to post” may differ from the mainstream. The best time to post on Instagram for the tech industry is Wednesdays from 10 - 11 am. The 2nd-best time is Thursdays 10 – 11 am and 2 – 3 pm. Other great times to post are 10 am – 5 pm Wednesday through Friday. The worst time to post on Instagram for the tech industry is anytime Sunday. 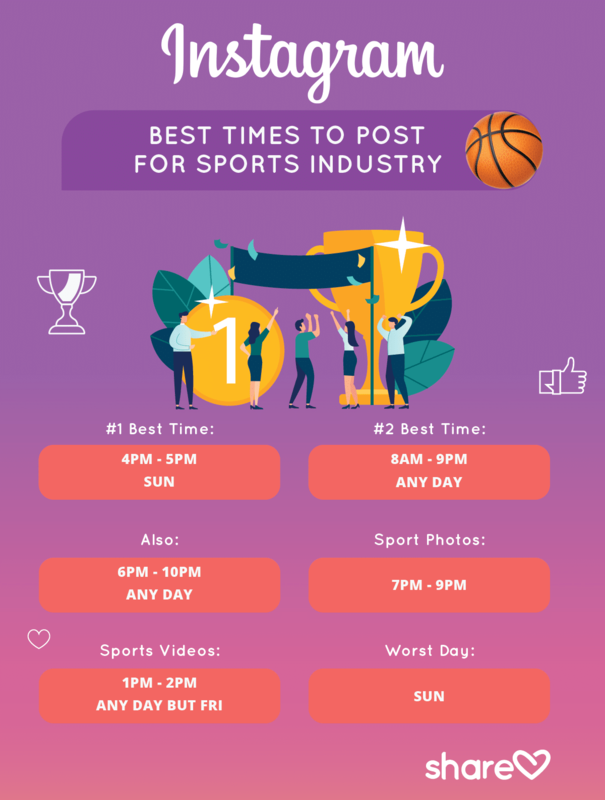 The best time for sports brands to post on Instagram is on Sundays between 4 - 5 pm. The 2nd-best time is 8 – 9 pm any day of the week. Other good times to post are between 6 – 10 pm on any day. If you’re posting sports photos, 7 – 9 pm is best. 4 – 5 pm and 10 – 11 pm are also good times to post photos. If you’re posting sports videos, 1 – 2 pm is best. The worst time to post for the sports industry is on Fridays. 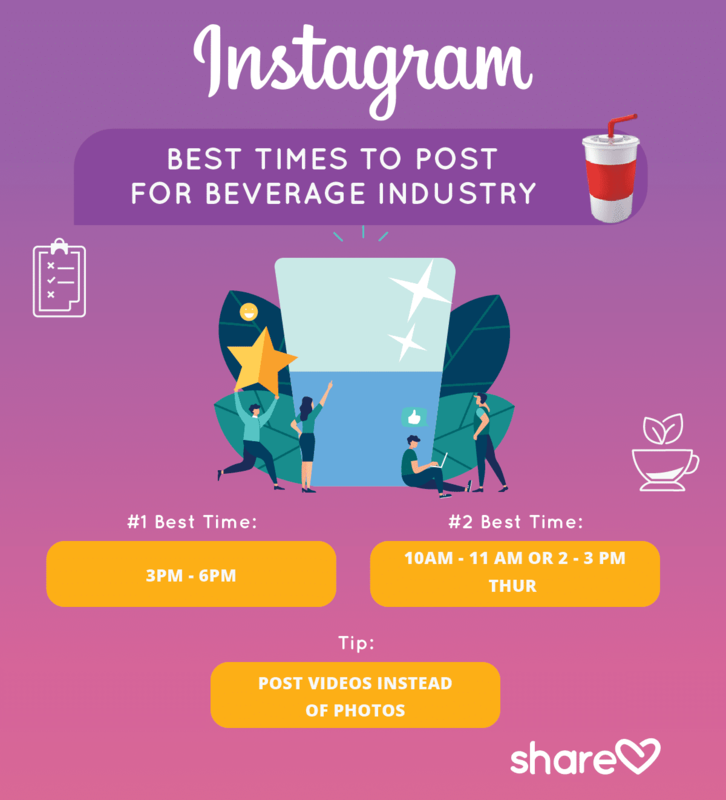 The Best Time for beverage-brands to post on Instagram is between 3 - 6 pm. This is the time when viewers are thirsty and impulsive. Also, lean toward videos over photos when posting beverages. A recent Instagram in-house study revealed that mobile users are more impulsive when it comes to purchasing beverages. This makes photos and videos a powerful way to influence their purchase decisions. 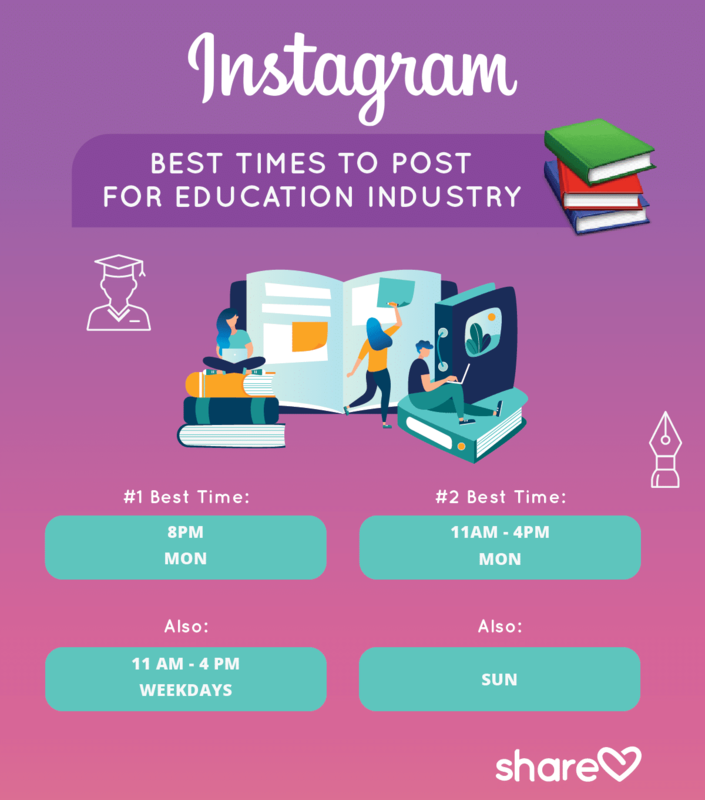 The Best Time to Post on Instagram for Education is Mondays at 8 pm. The 2nd-best time is Monday between 11 am – 4 pm. Other good times to post are weekdays between 11 am – 4 pm. The worst time to post for the education industry is on Sundays. You might think that mealtimes are the best times for restaurants to post on Instagram, but old routines are beginning to fluctuate. The best times for restaurants to post to social media are changing rapidly because our food culture is changing right now. Instagram reports a rise in “snacking behavior” that’s challenging breakfast, lunch, and dinner patterns. Mealtimes are becoming “more fluid than ever,” and they’re driven by people’s lifestyles instead of traditional mealtime habits. U.S. consumers are 63% more likely to snack in place of a meal and 84% of them snack in-between meals. Since over 45% of people use a smartphone while in restaurants and bars, use your peak hours to encourage customers to share to social media. Should you post on Instagram as often as possible? Probably not. Post Instagram Stories as often as possible. Post more often during special events. Publish posts only as often as you can create high-quality, interesting content that your audience loves to engage with. Why are so many brands posting more often than normal? 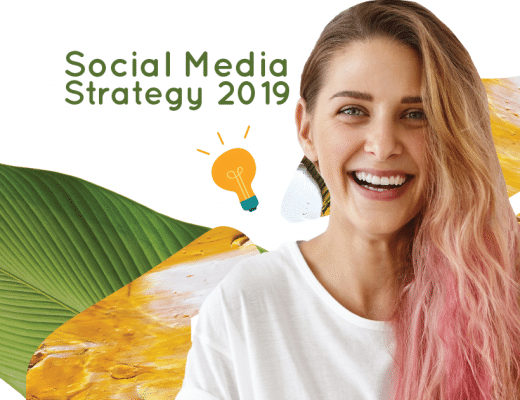 Brands noticed a significant decline in engagement after the release of Instagram’s algorithm early last year. As a result, many of them began posting more often, hoping it would help them get seen. It quickly became clear that the quality of your content has far more power than how often you post. The release of the “You’re All Caught Up,” feature puts even more pressure on brands to make every post interesting to their audience. TechCrunch reports an upcoming “Do Not Disturb” feature that Instagram and Facebook are prototyping. The feature would allow users to turn off notifications for a specific amount of time, further discouraging brands from over-posting. “Frequency” does not refer to how often you post. Instead, it refers to the fact that the algorithm takes a look at how often a user logs on and tries to show them the best posts since their last visit. 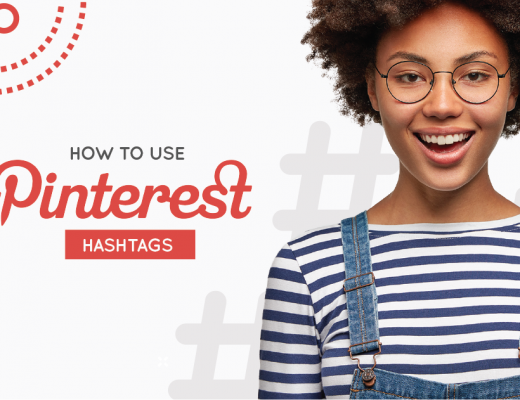 Since interest, recency, and relationship are the 3 core factors, brands should decide how often they can publish posts that will engage their users. Then, publish consistently on a regular basis. The quality of your Instagram posts is far more important than how often you post. Keep your content interesting with a healthy balance of video, photo, and stories – but only according to your ability to consistently publish quality material. Be sure to size your photos and videos correctly to achieve the highest-quality images. The schedules above are based on the highest-engagement times for businesses. If you’re new to Instagram, they can be very helpful in making decisions about when to post your content. 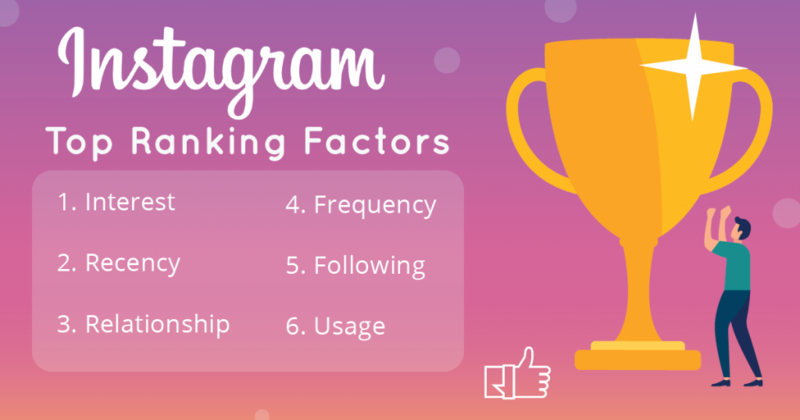 If your engagement rates need a perk, the best posting times can also help you discover times that may improve your brand’s performance on Instagram. But the ultimate times to post on Instagram depend on your audience. When you’re ready to dig deeper and find the best times to post for your audience, Instagram Insights offers solid data about when your audience is online and most-engaged. 1. Make your posts irresistible. Publish the most compelling photos, videos, and stories your brand is capable of. 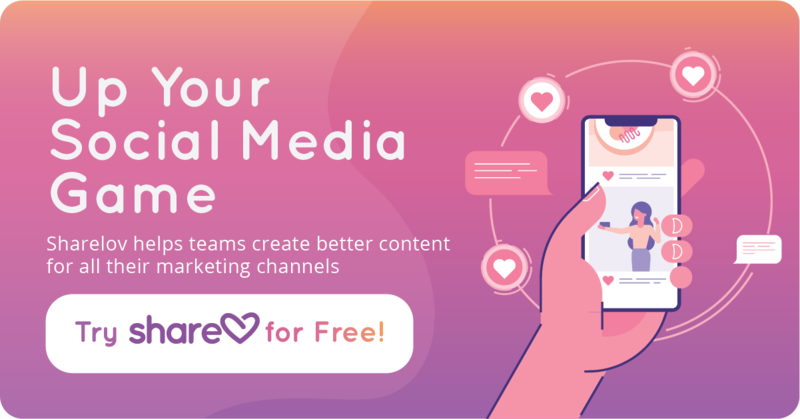 When people interact with your posts, this tells Instagram that your brand is sharing quality content, and then more people will see your posts. 2. Remember that consistency is more important than frequency. Develop a posting schedule based on how often you can publish quality material, and then stick to the plan. It’s better to post 1 compelling image a day than 6 that get ignored. Publishing on a consistent schedule shows reliability and helps build trust between your brand and its audience. Instagram’s demand for quality is high, and successful content is usually produced by a team of people working together. Teams can create original, engaging content week after week. Teams can quality-check photos, videos, and messages before they’re published. Teams help avoid errors in messaging that might harm a brand’s reputation. Very interesting to see the shift in times. I remember that evenings were best but now it’s shifted to lunchtime. Is that because the audience is expanding to an older demo?